As Twickenham is to London, so the Stade de France is to Paris - situated out in the suburbs in the town of Saint-Denis. This is France's national stadium - and one of the world's greats - with an 80,000 capacity and a futuristic look to the vast bowl whichever direction you approach it from. Most visitors get there by one of the two RER train lines a few minutes' journey due north from Paris city centre. Stade de France was built to host the 1998 football World Cup and it all went very well as the hosts defeated Brazil 3-0 in the final. Also in soccer, both France and the club side Lille have played home matches there, in addition to two Champions League finals. But the only Parisian club side to call the stadium home - on an irregular basis - has been rugby's Stade Français. The team bankrolled by media mogul Max Guazzini deployed dancing girls and cut-price ticketing to attract capacity and therefore world record club crowds (for regular season league matches) to watch Stade Français face the likes of Biarritz and Toulouse. 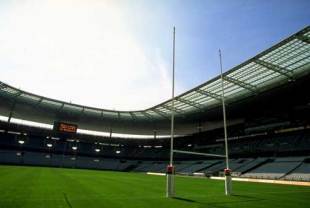 The annual French Championship final is also played at Stade de France. The French Rugby Federation switched all their home Six Nations matches to Stade de France from 1998 onwards and the inaugural game was a 24-17 defeat of England. On match days temporary bars and food stalls spring up out of nowhere together with the brass bands of Les Bleus' followers, although many spectators feel the atmosphere inside the ground was livelier at the previous venue, the Parc des Princes. When France hosted the 2007 Rugby World Cup, the Stade de France was a glittering and fitting venue for three pool matches, one quarter-final, both semi-finals and the final when South Africa defeated England 15-6.